Stalks of fragrant color in lavender, pink and magenta! This prolific bloomer draws butterflies and admiring glances! Rounded shrub has slender, arching branches and long panicles of star-like flowers. Handsome in almost any setting. 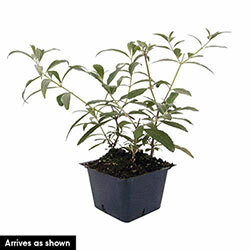 Foliage Type: Dark green, lanceolate leaves 4-10" long, white and glabrous beneath. 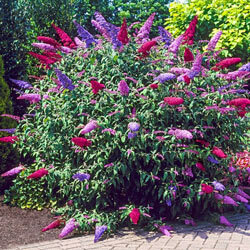 Flower Form: Lilac-like, long terminal panicles up to 10" of a mass of tiny star-like flowers. Planting Instructions: Plant firmly and set crown just below soil level. Firm and water in well. Soil Requirements: Well drained, humus enriched soil. Once established will tolerate some drought. Pruning: Cut back all flowering stems close to the base in early spring. Early spring, as new growth begins. Winter Care: Mulch in colder climates, remove in early spring before growth starts. 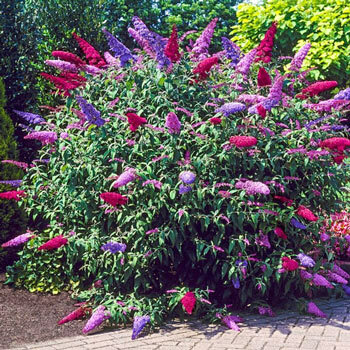 Additional Information: In northern climates Buddleias behave like herbaceous perennials with the top growth dying back in winter. Prune back to new growth in the spring. In southern climates, prune to shape.